With walking and cycling now recognised as one of the healthiest exercises for people of all ages there is something in Waterville for people of all ages. You will also see that bit more of the Countryside while you breathe the fresh Atlantic air. A quiet stroll by Loch Currane is only Minutes away when you stop in Waterville. A brisk walk through quiet by-roads and nearby valleys is pure joy. The Countryside is calm and unspoilt and the mountain streams crystal clear. 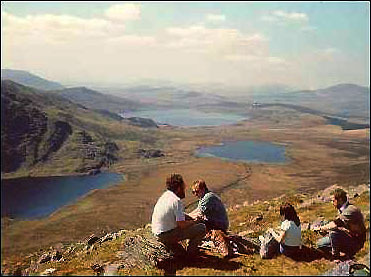 For the more enthusiastic walker take yourself to the mountains and explore the Kerry Way- Irelands premier walking route and enjoy the panoramic views of the splendid lake district of the mountain valleys surrounding Waterville. The network of safe roads in the vicinity of Waterville are ideal for the cyclist and walker. Many daytrips can be enjoyed such as a trip by the Glenmore Lakes or further a field along the Cumeragh Valley and Lakes and the scenic Skellig Ring. The earliest date which we may regard as recorded history of the Skellig is 490. It was then that Duach, King of West Munster, Pursued by the King, pursued by the King of Cashel, took refuge on the Skellig. Gannets - 20,000 breeding pairs, making it the second largest colony of this species in the world. Now there is little room or turf for other species and only a handful of Fulmars, Puffins and Razorbills breed although the cliff ledges support over the 1,100 pairs of Kittiwakes and about 600 guillemots. We must upset our time sequence and go back to 1910 to give George Bernard Shaw the last word on rowing to the Skelligs. Bernard Shaw. "But for the magic that takes you to out, far out of this time and this world, there is Skellig Michael ten miles off the Waterville Coast, shooting straight up 700 feet sheer out of the Atlantic. Whoever has not stood in the graveyard on the summit of that cliff among the beehive dwellings and their beehive oratory does not know Ireland through and through".